Now, my husband has always been an equal parenting partner. When the kids were little, he took paternity leave the moment I left to return to work, so the kids would have an extra couple of months at home with a parent. I don't hesitate for a moment to spend a weekend with girlfriends in a different city. The kids stay home with their dad. But the idea that he would dress them, give them medicine, oversee brushing their teeth (a job he oversees literally every night, but we're talking about morning toothbrushing here, people! )...it makes me nervous. My husband is a capable human being. He selects tasteful, appropriate clothing for the weather and the outing. The kids are well-trained in their routines, so he really is basically just supervising. But my concern is not the kids. I question, in my mind, whether it's fair that I get dressed in peace, while my husband's routine of putting on socks and shoes is interrupted to brush a bit of hair or to prod along a slow mover. (I hear you, women everywhere, thinking, "why the heck? 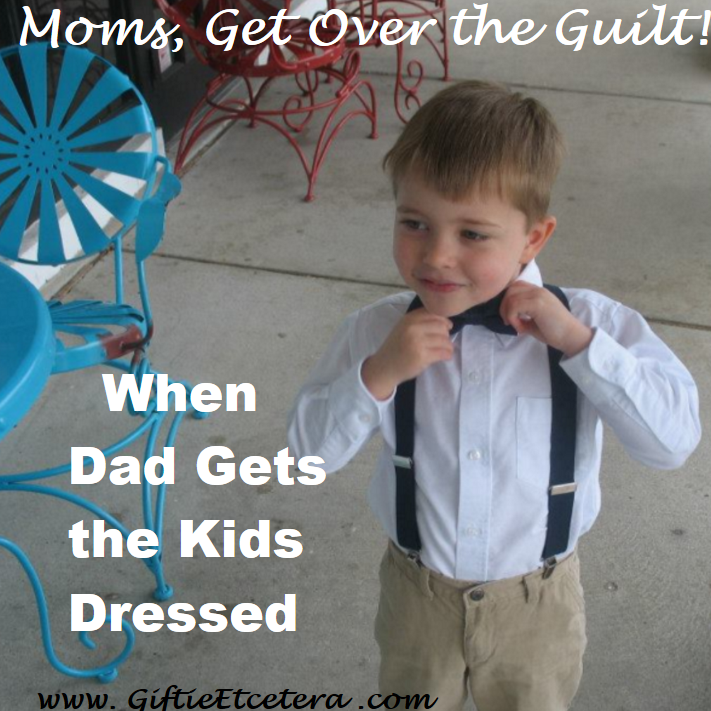 Her husband is getting the kids dressed - and she's complaining?!?" It's obviously fair for Dad to get the kids ready. Parenting is so much easier - and better for the kids and the adults - when done in a team. But as a mom, I feel like I should prepare my kids for the day. So I took a minute, scolded myself for my irrational response, and considered what I had done. My husband's been working long hours, so while he definitely partners with me on household chores, I had washed, dried, and supervised the putting away of the laundry that the kids were wearing. I had purchased the toothbrush and toothpaste, and the container that organizes those tools. I selected, bought, wrapped, and set out the birthday present that we were bringing. I had scheduled the outing with another mom. I had already done a lot of the getting ready, so my husband was only taking over a little part. I had zero cause to feel guilty. P.S. I composed this blog during the traumatic incident. In the end, the "getting ready" part went downhill and my husband had to call for my backup. I laughed and laughed at him, and explained that I was about to blog about how wonderful he was, but in the interest of honesty, would have to add that he did not succeed in doing this part alone! I sometimes suffer the irrational feeling that I should be doing the work. When my kids (who are now teens) have questions, etc. they always come to me. They are so used to this that they will walk by their dad to knock on the bedroom door while I am writing, etc to ask me the question. My husband does his best to jump in and assist, but the kids have been raised that mom runs the house because dad works. Makes it interesting when dad tries to assist. Finally, My husband and I had a long talk at which my husband told me that I have done almost everything to do with the house and kids since they were little so it is ridiculous to feel guilty if he wants to help me now that his job and our situation allows him to. Dont get me wrong, my husband was wonderful when the kids were little, but I took stay at home mom to heart and took over all the laundry, cooking, shopping, school events, sick kids, well kids, parties, etc. So, the kids see me as the ringleader. Things have definitely gotten less stressful and better for me now that I have let go of some of the guilt when I turn over the kids stuff to husband. Even something as simple as taking them to school would have made me feel guilty if my husband had done it instead of me. But now it is nice to delegate and know that it is okay to want that peaceful "just me" time. You captured the feelings so well in your comment, Jaime. I can inappropriately obsess over things, too. It is wonderful that your husband is willing to do so much. Mine is too, but I can understand the guilt/angst that sometimes comes with it. Now after being married almost 20 years, and going through multiple transitions together, I am pretty much at peace with it. But my husband has way more energy than I do, and does more, so sometimes I do still feel guilty about it. I remember being a teenager reading a magazine column called "Can This Marriage be Saved". The therapist/writer had a couple in therapy arguing about how the childrearing and household tasks are completed. His complaint was that she wanted him to help...so he helped...then she'd complain anyway. Her complaint was that he didn't do those things the way she did. The therapist's advice was for her to remember that if you want your spouse's help...you have to give him the freedom to perform tasks his own way. I was only 14 or so when I read that and didn't get married until 35 but for some reason that stuck with me. But it is SO SO SO hard to let go that way! Yes it is hard sometimes to let go as a mother but really Dads are quite capable if given the chance. We need to let go of the guilt and enjoy the fact that Dads want to be part of the parenting process. thanks for sharing your thoughts with us at Over the Moon. Phillip is great and does a better job than me of getting the kids ready to leave the house on time - because he knows that mismatched socks are better than being late, while I'm still learning that!